This liquid glows under blacklight and is ideal when a liquid application is needed.� Available in 7 colors - UV-red, UV-pink, UV-orange, UV-green, UV-yellow, UV-blue, UV-purple. Aquacolor DayGlow liquid make up glows under blacklight and is a highly pigmented liquid version of the popular Kryolan Aquacolor cake make up. Aquacolor liquids are ready to use and are ideal for fast face and body art because they require no additional mixing. Simply dip your brush or sponge in the paint and apply to skin. 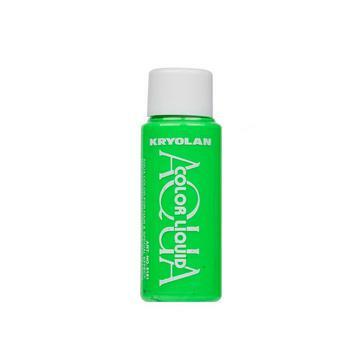 Kryolan make up is made using the finest minerals and pigments and is safe for all skin types. Aquacolor liquids dry within seconds to a smudge free finish without cracking or staining. Aquacolor Liquid Make Up can also be used with your airbrush. To use through an airbrush mix with mixing liquid (Final seal, Mehron mixing liquid, or Liquiset) or distilled water to a thinner consistency suitable to flow through your airbrush. Typically an 80/20 paint to mix ratio. To use and remove: Dip your brush or sponge in the paint and apply to skin. Aquacolor liquids remove easily with soap and water.